Microsoft explains it as well as anyone here. Below are the steps to take in Outlook 2016 after the permissions have been granted. 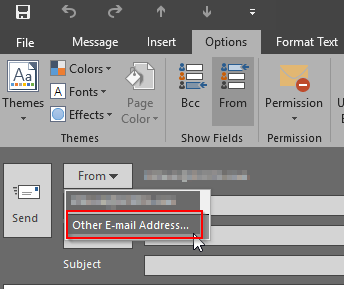 In Outlook 2016, click “New Email”. In the Message Window, click on the “Options” tab. Enter the email address you want to send “On Behalf” of. Again, you’ll have to have enabled this through the Office 365 portal explained in the previous link.